The Carolina Panthers will be wearing their legendary black-on-black jerseys this coming Sunday against the Buccs. This will also be the first time we will break out their all-black jerseys in a regular season game since way back in 2013 when we lost the Divisional Playoff game to the San Francisco 49ers. Since 2013, we have been exclusively wearing all-white uniforms in the playoffs, and it’s been working. Out of whole playoff history, we’ve won a total of nine times while wearing all white. By comparison, every time we wore our black home uniform or some alteration of it in the playoffs, we lost (2008 vs. the Arizona Cardinals, 2013 vs. the 49ers, and Super Bowl 50 vs. the Broncos). 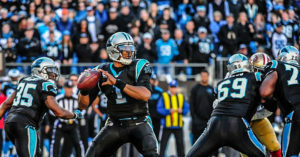 What do you think about the Panthers decision to wear all black this Sunday?